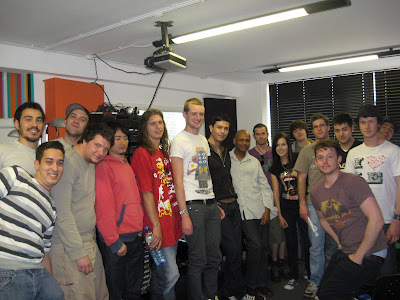 This month, students on Point Blank's music production courses were treated to a masterclass from groove-merchant John Mckenzie. His words of wisdom emanate from a career of playing with some of the biggest music stars in the world, from recording with David Bowie to playing in front of thousands with the likes of Tina Turner, Seal and Shakira. Perhaps slightly more relevant to the interests of this particular audience was his involvement in the dance music scene having worked on records with legends such as Danny Tenaglia, and Everything But The Girl. John started by treating us to a few renditions of his favourite bass lines: 'Good Times' originally played by Bernhard Edwards and famously sampled by The Sugar Hill Gang in 'Rappers Delight', 'Another One Bites the Dust' which is another modern tribute to the 'Good Times' riff, 'Red Alert' by Bassment Jaxx, and 'Papa was a Rollin' Stone' by The Temptations. Performing these without the groove was hard for him, going against all the natural instincts that are ingrained into his finger-tips, but hearing them in this form really emphasised the fact that the groove can potentially be the crucial difference between a stale plodding bassline and a timeless classic. "Every piece of music has a groove, even a piece of classical music or a slow piece of music has a central groove … the cornerstone of making music is discovering where the groove lies"
"It is the percussive hits of the right hand strumming that is the driving force behind the groove-factor"
"The best basslines are often the most simple ones, 'Papa was a Rollin' Stone' being a prime example. 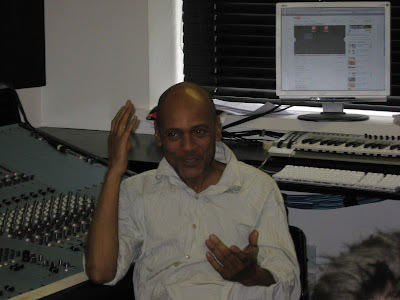 It is easy to make a bassline too busy... placement of the notes is the important thing"
"The groove is not just about the bass; guitars, keyboards and percussion can all contribute. This is especially evident when you hear a good live drummer - the natural variable decay and velocity, and the subtle grace notes all add to the groove-factor. Percussion parts without this human feel can sound robotic and cold, hence why it is important to use techniques such as varying note velocity when building your percussion tracks in sequencers." We finished by discussing the importance of compression, creating 'room' in your tunes, and not over-obsessing too much about minor details. As music producers we tend to be perfectionists but most music listeners like to let music wash over them and will not notice small idiosyncrasies. Essentially if the tune has a good groove and a catchy bassline, you are likely to see smiles on the dancefloor! 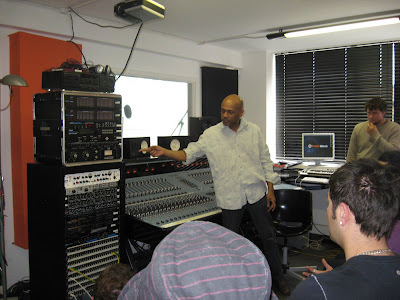 If you want to learn music production with a solid groove and bassline, he is doing another series of masterclasses with drummer, Andy Numark in London in around 3 months time keep your eyes peeled for those. The series of our own masterclasses, free for all students on our music courses, will continue next month.